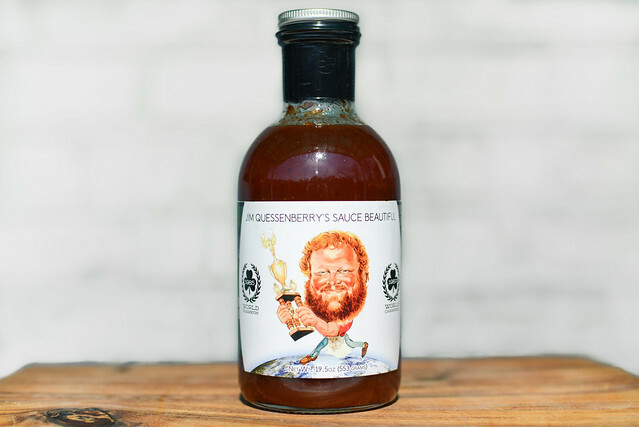 Jim Quessenberry's Sauce Beautiful strikes a great balance between tangy and sweet with a bright and fresh tomato flavor that gets an earthy and spicy depth from a plethora of spices. This bottle of sauce was sent to me by Peter Grumbles, one of the four people behind Bluff City BBQ Supply, LLC., an online barbecue retailer formed last year in Memphis, TN that sells everything from smokers to sauces to books and more. 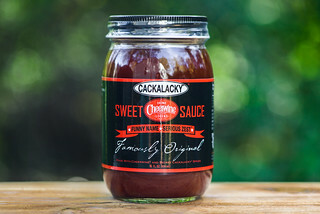 Two of the other founders of the company are Michael & Lee Quessenberry, sons of Jim Quessenberry who was a two time Irish Cup International Barbecue Contest champion and at the helm of the Arkansas-based Trav'ler competition team. Jim created this sauce in the 1980's while he was on the circuits, and Michael & Lee recently resurrected it for sale to masses. The aroma of vinegar abounds in Sauce Beautiful, creating a super tangy character that's strong enough to give the nose a little singe. There's a mild sweetness that balances the vinegar, and a vibrant and fruity tomato smell. Behind those standard barbecue sauce components is a distinct spice that hints at a nice heat with a light, earthy character. The semi-transparency of this rusty red sauces lets you clearly see the plethora of spice specs that come in white, red, and black. The sauce is also super smooth with a shiny, glossy sheen. It has a thin constancy that's like vinegar with a bit of ketchup mixed in. This thinness translates to a fast, steady pour from a suspended spoon that only breaks up when the sauce has almost completely left the silverware and a few final drips remain. Once the sauce has stopped flowing, there's a thin, transparent coating left clinging that is heavily dotted with spices. Despite the strong aroma and well seasoned appearance, the first taste of Sauce Beautiful is oddly bland. There's an upfront sweetness that's mild, but strong enough to hold the vinegar back from the get go. As the sauce settles on the tongue though, the flavor ramps up. Quickly, a very nice balance between sugar, vinegar, and tomato takes hold to create a fresh, bright, and clean barbecue profile. 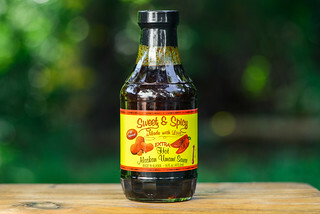 The vinegar amps up just a bit more as the sauce lingers, but still never to the extent hinted at by the super tangy aroma, staying in a pleasing companionship with everything else. What does change is the depth the sauce gains from the spices. It starts with an earthy profile that has a background taste of garlic and onion as well. Black pepper begins the build up of heat with it's subdued bite, then red pepper gives the sauce a nice spiciness. This leaves the final aftertaste with a medium heat against a sour vinegar and mild sweetness. The sauce coated the chicken leg thinly, but evenly. As it sat over indirect heat, it did bake away a bit, leaving more spices than sauce on the chicken. Over direct heat there was light caramelization, and the final brushing I gave the chicken stayed in tact, leaving the leg shiny and beautiful. The flavor remained bright and balanced—a mixture of fresh tomato, tangy vinegar, and a sugary sweetness that was a bit more pronounced than out of the jar. The power of the spices also remained, giving the meat an earthy complexity without muddling those very nice upfront flavors. Sauce beautiful was originally created as a finishing sauce rather than cooking sauce and it shows. Its thin consistency isn't the best at coating meat, and it also baked away a bit over the heat of the fire. Even so, it still preformed well, delivering quality taste with bright and fresh flavors that struck a really nice balance between them all, creating a well layered, pleasing sauce. 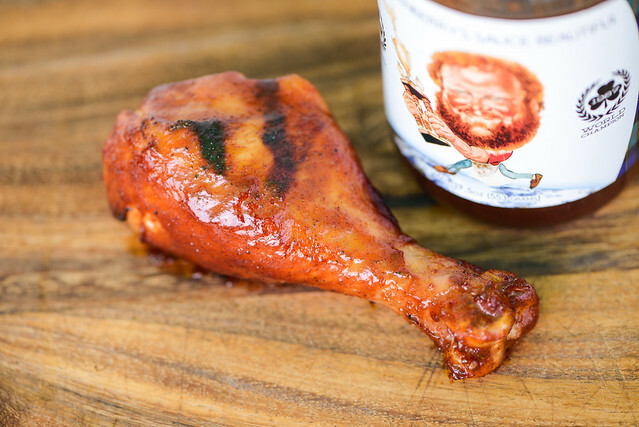 My ideal usage would be to slather this over a pile of smoky pulled pork, but it has the promise to do so much more like awakening ho-hum chicken or pork chops, as an alternative to ketchup on burgers, heck, I'd even dip my fries in this! 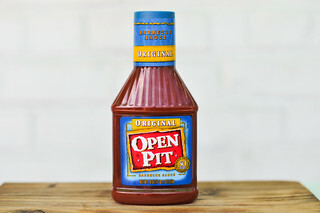 Bluff City should do everyone a favor and change the name of this to Jim Q's Sauce! That last name is tough to spell and sounds like an unpleasant cousin to a raspberry. Chad's not the first person that confused my last name with a berry to eat. ;) The slang term we have used a lot around our friends and family is Q-Sauce, but if the name was unique enough for you to make a comment, then I think our job of marketing the sauce is well done. We appreciate the 8/10 score and I can say this, the review is spot on although my friends obviously would give it a 10/10. Our father was a pioneer in competition cooking and was one of about 10 teams to cook in the second ever Memphis in May contests and went on to cook there for about 20 years. He took top honors many times in various competitions including 2 world championships in 1985 and 1987 in Lisdoonvarna, Ireland. We are extremely excited to add this accolade to our list of achievements. Thanks for the feedback, and if you ever want to reach out to us, please do so. We're really friendly guys! Josh, many of my friends dip their fries in the sauce. A friend of mine eats it on toast, and my brother and I know the limitations of cooking with it too early in competitions. 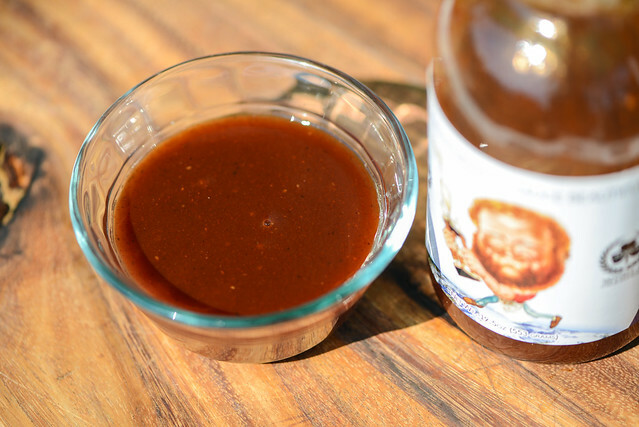 It was originally designed as a complimentary sauce or table sauce and we usually apply it about 30 minutes before its time to take the shoulders or ribs up from the smoker. I am pleased with the review. Regarding your 8/10 ranking, was just wondering how does anyone who has ever tried your sauce ever have the gumption to try some other sauce to see if it is any better? Met you and your assistant awhile back in Jboro, AR, tasted your free samples, and then bought two bottles, one hot and one mild. Went back yesterday and bought four more mild cause the wife doesn't care for the hotter stuff. Am proud to offer your sauce to my family and friends when they come over. Thank you. Thank you Superstar! That's one of the best things we've ever had said about us. Would you be willing to let us quote you on that? You have my permission to quote that. Well you guys, it's been a while and I wanted to let you all know that we are going to be focusing on the Jim Quessenberry moniker for our brand and Bluff City BBQ Supply will become more of an umbrella company to manufacture and distribute the products. We're more than happy with the reviews we've accumulated over the past year and this review has given us some great exposure. Thanks to all of you!